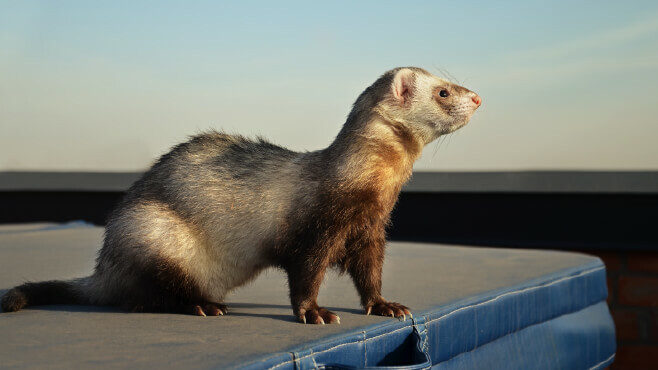 Ferrets are unique and exciting pets that can make wonderful companions for the right people. However, it is important to remember that they do have special requirements when it comes to their care. Ferrets are clean animals that need a lot of mental stimulation, exercise, and play. They also need to be handled and housed properly, their diet needs to be of high quality in order to avoid health problems, and they need a lot of supervised attention on the part of their owner. Please note that the information below describes the basics of ferret care. There is a lot more that you will need to learn as an owner in order to help your ferret live a happy and healthy life. We recommend a cage that is at least 36 inches long, 25 inches wide, and 38.5 inches high (91.44 cm x 63.5 cm x 97.79 cm) for a single or two ferrets. It needs to be large enough to allow space for litter boxes, sleeping areas (at least two), and food and water. Make sure the cage is adequately ventilated. 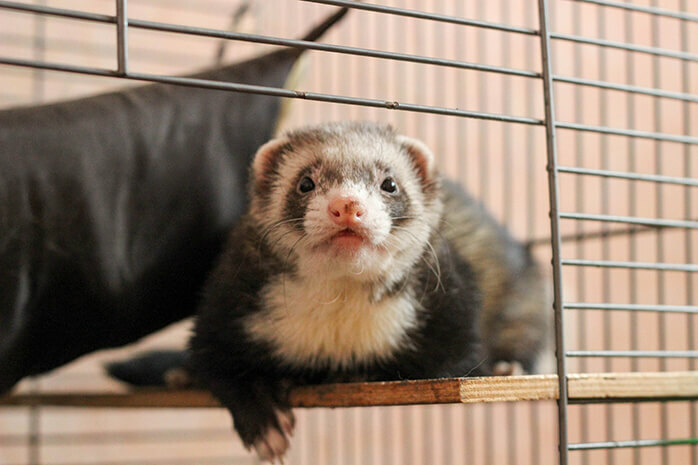 The best cages for ferrets are those with closely set wire bars, which are adequately ventilated and kept out of direct sunlight to maintain an appropriate temperature. It is highly inappropriate to keep ferrets in aquariums due to lack of ventilation and unsanitary conditions. Ensure that any wires/bars are no more than 1 inch (2.54 cm) apart, since ferrets may be able to squeeze through larger openings. The wires/bars should also be strong and thick so they cannot be bent. Ferrets are smart, so the locking mechanism of the cage should be physically impossible for your ferret to open, even if they figure out how to do it! You will be cleaning your ferret’s cage every day. In order to get this chore done with relative ease, we recommend a cage that allows you to swing the whole door open to allow you to access all parts of the cage. This will keep cleaning time to a minimum and and allow you to do it without too much hassle. For more information on buying the best ferret cage to suit your needs, we recommend checking out our article on ferret cages. 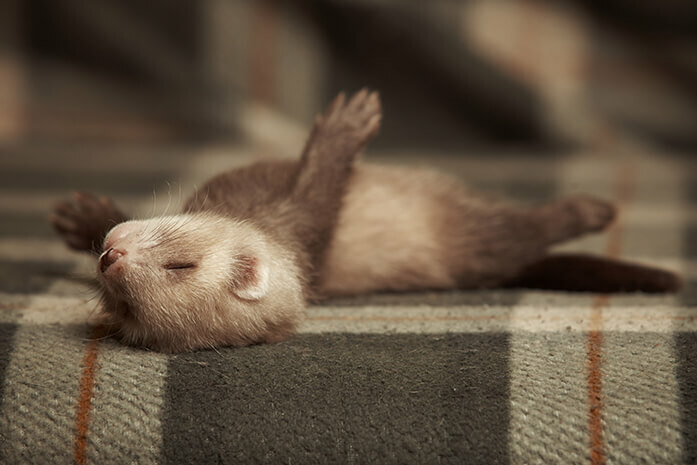 Ferrets are known to sleep for up to 18 hours a day. Their wild ancestor, the polecat, prefers to sleep in dark, enclosed burrows for safety and comfort. This is why it is important to provide your ferret with adequate bedding that suits his needs. 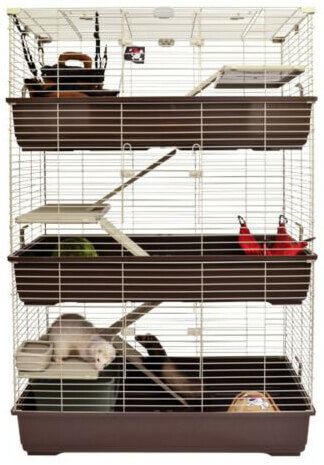 Ideally, you want to have a few varieties of ferret bedding in the cage for him. A ferret generally has a few favourite spots that he will sleep in regularly. But having a variety of options also makes the cage more interesting. Rotating bedding options can also add a little variety and excitement to a ferret's life. The best types of bedding for ferrets include fleece blankets, old t-shirts, hammocks, cubes and other novelty ferrets beds. For more information on ferrets beds, please go to our article on ferret beds. Handling your ferret every day is important in order to help him get used to you and bond with you. Handling is also essential for socialization and training him not to bite. The more handled a ferret is (especially from a young age), the tamer he will become, which will make the time you spend with your ferret a lot more enjoyable. In addition, your vet will be grateful for your work because it will make her job easier. It is important to note that ferrets are generally very energetic, wriggly animals that can easily be dropped (which can cause injury), so it is important to make sure you have a good grip when holding them in order to prevent them either jumping or wriggling out of your arms or being dropped. Scruffing. Scruffing is done by gathering the loose skin on the back of the neck into a bunch and picking them up with it. Ferret moms (just like cat moms) carry their babies by scruffing them. The topic of ferret diet is large and complex. It requires you to do a lot of research in order to make sure your ferret is getting the right dietary requirements. 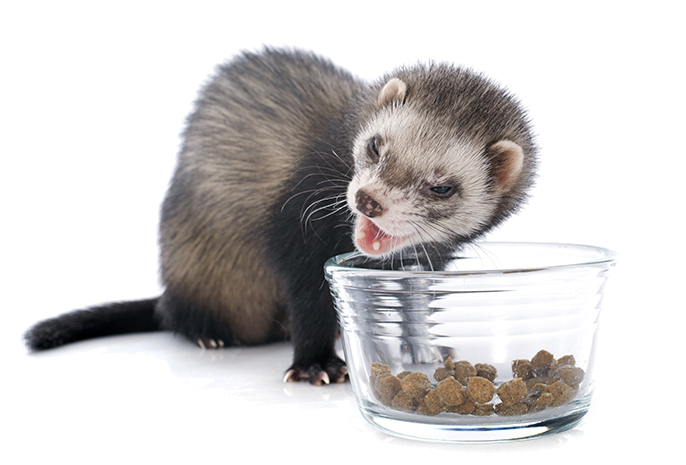 Your ferret’s health requires a high-quality diet; otherwise you might find yourself spending more money on vet bills due to your ferret’s poor health. Ferrets are obligate carnivores, which means that they lack the enzymes in their bodies required to process plant and plant-based materials. Their diets should entirely consist of meat and meat-based products. Ferrets need a lot of protein and fat and very little fiber and carbohydrates to stay healthy. Because they cannot digest plant matter well, the protein and fat must come from meat-based sources. Ferrets also need a 1:1 balance of calcium and phosphorus. Calcium is found in bones and phosphorus in tissue meats. Most commercial kibbles have an appropriate calcium to phosphorus ratio. 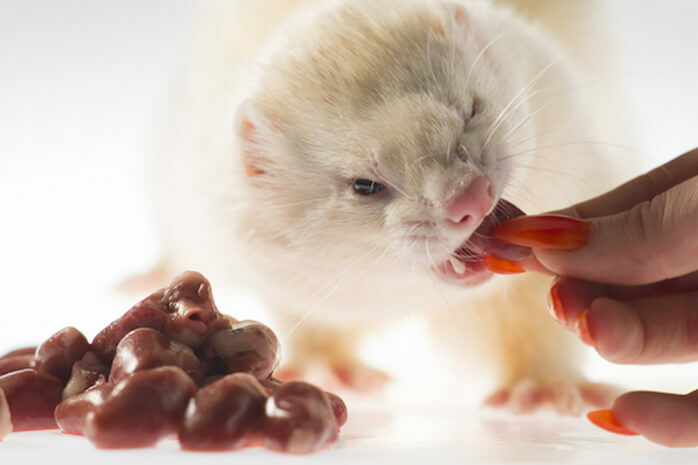 Generally there are two types of diet that people feed their ferrets: high-quality commercial foods or a raw diet (or a combination of both). The general rule of thumb for commercial diets is to make sure you look at the ingredients list, especially the first five ingredients. These should be meat or meat-based ingredients. When it comes to changing your ferret to an entirely raw food or whole prey diet, it is important to do lots of research first. Different meats, offcuts, and organs will have different nutritional values; some have more nutrients and minerals and others have fewer. This is why you really need to know what you are doing when feeding a raw diet. Otherwise your ferret could become nutritionally deficient and sick. A lot of ferret owners swear by a raw and whole prey diet and have had great results with it. But if done wrong, it could be very detrimental to your ferret. When feeding your ferret a raw meat-based diet, make sure that you feed a wide variety of meats, organs, and bones. For more information, visit our ferret food page. 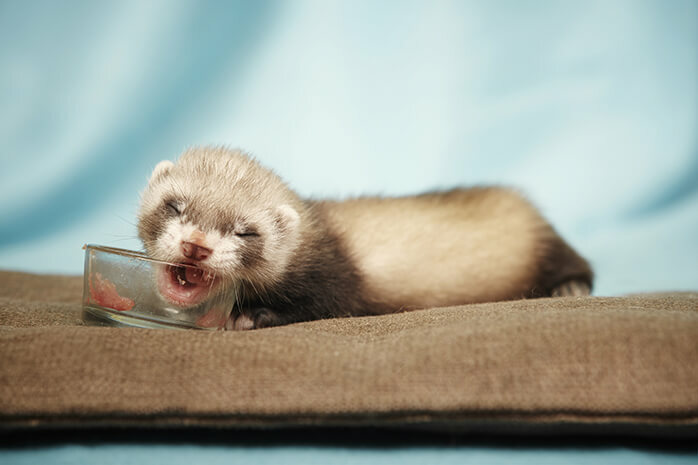 Once ferrets wake up after sleeping 18 hours a day, they are full of energy and ready to bounce off the walls. Ferrets are highly intelligent animals, which require a lot of mental stimulation during play time. The general consensus amongst the ferret community is that ferrets require at least 4 hours/day outside their cage. At least 2 of those hours should be highly interactive playtime. This means that you will need to spend a lot of time playing with your ferret and making sure you are meeting his mental health needs. You can do this by making or purchasing a variety of toys he can play with, steal and stash, climb or run through. Most importantly, ferrets love human interaction and affection. They want you to get on the floor with them to play. Exercise and play not only help to keep your ferret’s intelligent mind happy but also allow him to stay physically healthy too. Exercise keeps a ferret fit and builds muscle, which aids in coordination and movement. 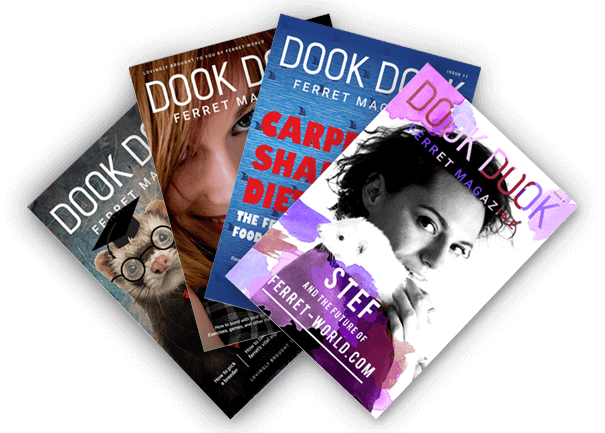 For more ideas on toys and games, check out the 101 Ferret Games and Homemade Ferret Toys eBook. Ferrets are very clean animals normally. You will need to get into a routine with your cleaning to make sure you uphold hygiene standards as well as looking after your ferret’s general wellbeing. Cleaning and hygiene includes changing the litter tray everyday, washing their bedding once a week, clipping their nails once every second week, cleaning their ears every few months, deep cleaning their enclosure once a month, and more. However, one thing that you will practically never need to do is bathe your ferret. Unless they get into mud or dirt, a ferret’s coat is self cleaning, and they have oils in their skin that can go into overdrive if they are washed too often. This can lead to the ferret developing a stronger smell and getting dry, itchy, unhealthy skin. Provide a high-quality diet, clean water, good sleep, lots of exercise, and hygienic living conditions (as described above). Find the right vet. 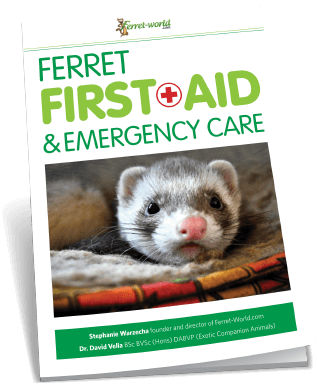 Before you get a ferret, it is important to find the right veterinarian to look after your ferret’s needs. 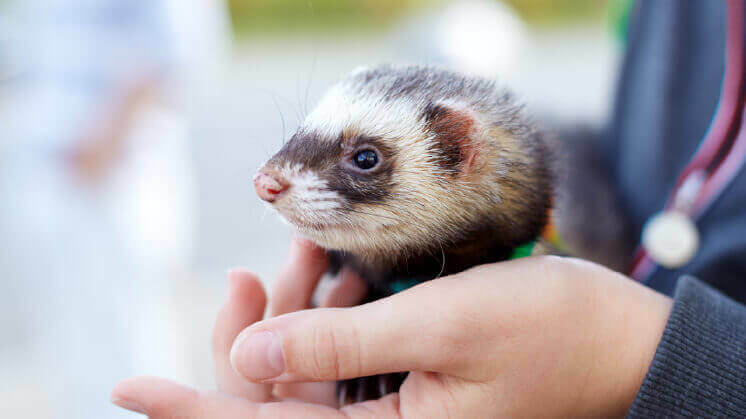 Call local veterinary practices to see which one treats the most ferrets, or get in touch with your local ferret shelter and find out who they use to treat their ferrets. Desex or spay your female ferret (also called a jill). 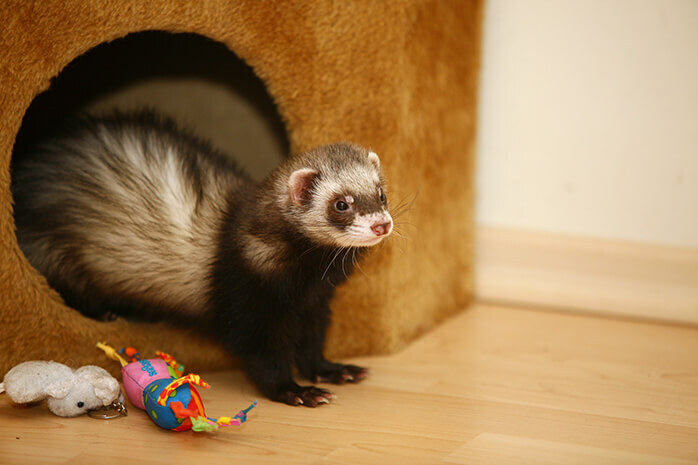 If you are getting an intact female ferret, then you will need to have her desexed when she is 4-6 months. Otherwise she is likely to go into heat and once she is in heat, she may develop a condition called aplastic anemia. This condition is very serious and could even kill her if she is not brought out of heat with a jill jab, vasectomised male, or through mating. Talk to your vet about the best option for your ferret. Neuter your male ferret (hob). Intact male ferrets can become very stinky and aggressive when their mating season begins. The smell is due to hormones that cause them to secrete more musk. Hobs also groom themselves with urine to attract female mates. Most ferret experts recommend that you neuter your hob around 5-7 months of age. Get vaccinations and yearly checkups. Your ferret will need to visit a vet for regular checkups and vaccinations at least once a year. During the checkup, your vet will also check for dental disease and any other disease symptoms. Set up a savings account for vet bills. Ferrets are prone to injuries and accidents due to their curious nature and high intelligence. They are also more fragile than other pets, such as dogs or cats. It is wise to make sure you have a special savings account just for emergency vet bills. You may also want to consider buying pet insurance if it is available for ferrets in your area. Be aware that ferrets are prone to diseases. Sadly, most ferrets will get very sick due to one of the many diseases that are common to ferrets. This reality means ongoing treatments and expensive vet bills. Ferret healthcare is expensive, and being prepared to pay for vet bills is an important part of caring for your ferret.